In 1966 feasibility and market studies revealed a definite market for a medium-sized turboprop mini-airliner for commuter and executive use. The H.P.137 Jetstrearn was launched, attracting nearly 200 orders and options in the first year. It even won the United States Air Force contest for the C-10A transport. But it was a difficult aircraft for a firm used to large and expensive military designs, and development was prolonged. Its airworthiness category imposed a nominal limit in all-up weight which severely affected range/load performance. 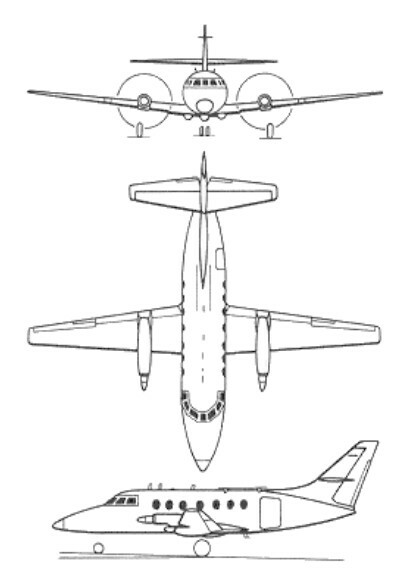 This was improved with the advent of higher-power engines and a change in category, which allowed take-off weight to rise to the level for which the Jetstream was designed. The Jetstream had accommodations for a crew of two plus flight attendant and 4-18 passengers. With a diameter of 6 feet, a length of 24 feet, and 613 cu. ft. of usable cabin space, the Jetstream has the largest interior in its class. There is stand-up headroom, ample walkaround space, and 14 windows. The HP.137 Jetstream was a pressurized 12/18 seat low-wing monoplane with a retractable undercarriage, powered by a pair of 840 hp Turbomeca Astazou XIV turboprops. Before the drawings were complete, Riley placed an order for 20 for the United States feeder liner market. The prototype H.P.137 (G-ATXH c/n 198) flew first on 18 August 1967 powered by the Astazou XII. The first four aircraft were powered by the French Astazou, the fifth aircraft was fitted with the US-built Garrett AiResearch TPE-331 instead to improve sales prospects in the US. This re-engining lead to an order by the US Air Force for 11 Jetstream 3M or C-10A as a mission support transport aircraft. Early 1969 however this order was cancelled on the grounds of late delivery. The Jetstream 1 had entered production by this time; with the first production model Jetstream 1 flying on 6 December 1968. Over the next year 36 would be delivered. The Astazou XIV engines however proved to be generally underpowered for the design. Due to these engine problems the Jetstream 1 was re-designed as the Jetstream 2 with more powerful 1073 hp Astazou XIVCs, starting deliveries in late 1969. By this point the late delivery and engine problems had driven costs to £13 million and Handley Page ran into serious financial difficulties. Only three Jetstream 2's would be completed before Handley Page went bankrupt, and the production line eventually shut down in 1970. Only 39 aircraft had been completed by the time of Handley Page's collapse in 1970. Although Handley Page was wound up as a company, the Jetstream lived on. Ten further aircraft were completed, five by Jetstream Aircraft and five by Scottish Aviation. In 1971 Scottish Jetstream Ltd was the name of a new company formed by Scottish Aviation and Jetstream Aircraft for the manufacture of the Jetstream twin turboprop transport. Scottish Aviation continued production of the Jetstream 2 although they referred to it as the Jetstream 200. The Royal Air Force ordered twenty-six Jetstream 200’s as navigation and multi-engine trainers known as the Jetstream T.1. The Royal Navy later subsequently took over some of these as T.2's. In 1977, Scottish Aviation was nationalized along with the British Aircraft Corp. and Hawker Siddeley Aviation to form British Aerospace. BAe decided the design was worth further development, and started work on a "Mark 3" Jetstream. The new version was re-engined with two 1020 hp Garrett TPE331-12UAR turboprops that offered significant advantages over the Turbomeca units. This allowed the aircraft the ability to operate at maximum load from a much greater range of airfields. The prototype of the BAe Jetstream 31, converted from an original HP137 airframe to suit revised FAR requirements for 19-seat commuter aircraft, made its maiden flight on 28 March 1980 (G-JSSD) from Prestwick Airport, Scotland and was airborne for 1hr 22min. Aboard on the flight were BAe test pilots Angus McVittie and J. L. S. 'Len' Houston, J. R. 'Bob' Baker from Garrett-AiResearch and BAe flight test engineer Andrew Eldred. The new British Aerospace Jetstream 31 entered production 28 March 1980 and is powered by two Garrett-AiResearch TPE331-IOU engines and also features advanced technology propellers and new electrical, air conditioning and cockpit systems. By 1994 some 380 had been delivered, 320 of those to the USA. The Royal Navy received four Jetstream 31 twin turboprops, designated T.3, which are used for observer training. These aircraft join 16 Astazou-powered T.2s which are used in similar roles. The T.3s differ not only in having Garrett TPE331 engines, but also in having an underfuselage Racal ASR360 search radar in place of the nose-mounted MEL E90 unit of the T.2. The RAF also used 11 Astazou powered Jetstream T.ls for multi-engine pilot training. Saudi Arabia has bought two Jetstream 31s for tornado crew training. In 1985, development of a further upgrade started resulting in the Jetstream Super 31, also known as the Jetstream 32, with more powerful engines that flew in 1988. The Jetstream 32EP (also known as Jetstream Super 31) was designed to increase the payload and range of the Jetstream 32 in extreme climatic conditions. It provides significant improvements in performance, derived from the use of two upgraded Garrett TPE331-12 turboprop engines flat-rated at 1,020 shp (760 k)XD and driving four-bladed advanced technology propellers. More than 310 Jetstream 31s and Super 31s had been ordered by 1987. In 1991, the 29-seat Jetstream 41 was introduced. Production of the Jetstream 31/32 ended in 1993, while the production of the Jetstream 41 ended in 1997. The Handley Page Jetstream came back for another round, as the newly certi-ficated Century Jetstream III, with 904 shp Garrett AiResearch TPE 331 turboprops in place of the French Astazous. Century Aircraft Corp. of Amarillo, Texas, Jetstream III is air-conditioned and pressurized at 6.5 psi. The conversion to Garrett engines allows a range of 1,920 miles out of a 426-gallon fuel capacity. The engine conversions were performed by Volpar, Inc. in Van Nuys, California. Jetstreams built since the early start in 1965 until the production ended in 1997 are: 38 H.P.137 Jetstream by Handley Page Ltd; 5 H.P.137 Jetstream by Jetstream Aircraft Ltd; 5 H.P.137 Jetstream by Scottish Aviation Ltd; 26 Jetstream T.1 by Scottish Aviation; 220 Jetstream 31 by British Aerospace; 161 Jetstream Super 31 by British Aerospace; 100 Jetstream 41 by British Aerospace. Accommodation: max. high density 18 passengers at 30 in pitch. Initial climb rate 2,100 fpm. Engines: 2 x Garrett TPE 331-10V-501H, 940 shp. Maximum ramp weight: 14,660 lbs. Maximum takeoff weight: 14,550 lbs. Standard empty weight: 9046 lbs. Maximum useful load: 5614 lbs. Maximum landing weight: 14,550 lbs. Maximum usable fuel: 3079 lbs. Best rate of climb: 2200 fpm. Maximum single-engine rate of climb: 520 fpm @ 109 kts. Single-engine climb gradient: 286 ft/nm. Fuel flow @ normal cruise: 460 pph. Stalling speed clean: 98 kts. Stalling speed gear/flaps down: 86 kts. Turbulent-air penetration speed: 180 kts. Engines: 2 x Garrett TPE 331-3U-303, 904 hp. Max TO wt: 12,500 lb. Equipped useful load: 3600 lb. Payload max fuel: 528 lb. Min field length: 2310 ft.